The parents of U.S. first lady Melania Trump have been sworn in as U.S. citizens, an upgrade from their previous status as permanent residents. 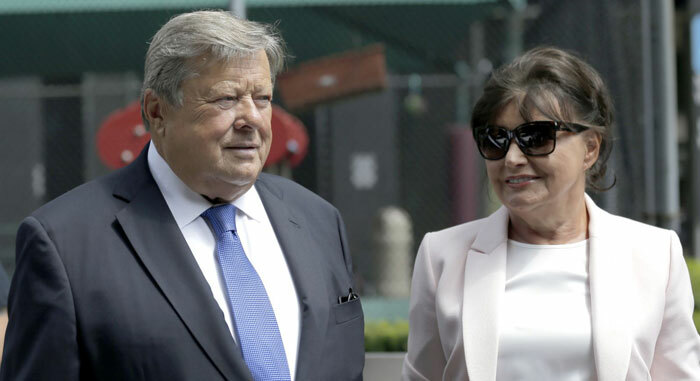 Viktor and Amalija Knavs took the citizenship oath Thursday in New York City, according to an attorney for the Slovenian couple. The attorney, Michael Wildes, told reporters the couple applied for citizenship "on their own." He did not specify whether this meant the Knavses had been sponsored by their daughter. U.S. President Donald Trump has spoken out against family-based immigration, the process by which a family member living legally in the United States may sponsor another family member who wishes to move to the U.S.
Trump has said the process, which he has called "chain migration," allows potential terrorists to enter the United States. In response to a terror attack in New York City on Oct. 31, 2017, Trump tweeted, "CHAIN MIGRATION must end now! Some people come in, and they bring their whole family with them, who can be truly evil. NOT ACCEPTABLE!" In January, in the president's annual State of the Union address, Trump said, "In recent weeks, two terrorist attacks in New York were made possible by the visa lottery and chain migration. In the age of terrorism, these programs present risks we can no longer afford." Wildes told ABC News on Thursday that the Knavses had engaged in "a wonderful journey like most have -- millions have -- in getting citizenship and waiting the requisite period of time. The application, the process, the interview was no different than anybody else's, other than security arrangements to facilitate today." The Knavses took their oath of citizenship at a federal building guarded by police from the Department of Homeland Security. The Knavses raised daughter Melania in the city of Sevnica, while Slovenia was under communist rule. Viktor was a car dealer; Amalija worked in a factory. Melania changed her name to Knauss when she began modeling. She met Donald Trump in New York City in 1998.